Born into a military family, Tōjō was a career army officer with political ambitions. He was an arch nationalist and a leader of the Toseiha, political faction in the Japanese Imperial Army, active in the 1920s and 1930s, that wanted the army to have a more prominent role in Japan’s political life. He fully supported Japan’s imperialist ambi­tions in China and the Asia-Pacific region. He gradually rose in seniority and became chief-of-staff of the Japanese Kwan­tung Army in China during 1937 and then Vice-Minister of War the next year. From December 1938 to 1940, Tōjō was Inspector-General of Army Aviation. Also in 1940 he headed the Taisei Yoku­sankai, Japan’s para-fascist organization created by Prime Minister Fumimaro Konoe to promote the goals of his “New Order” movement. It evolved into a political party that advocated creation of a totalitarian, single-party state to maximize efficiency of Japan’s total war effort in China. 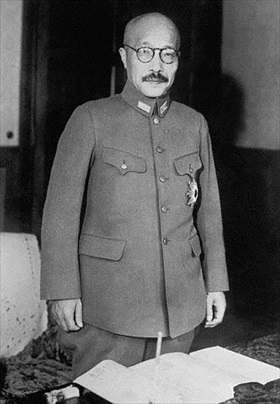 Between 1940 and 1941 Tōjō served as Army Minister in Konoe’s cabinet and helped move his country into the Tripartite Pact with German dictator Adolf Hitler and Italian dictator Benito Mussolini in September 1940. In October 1941 Tōjō moved into the prime minister’s seat after Konoe’s negoti­ations with the United States over its economic sanctions and embargo on oil and gasoline exports to Japan proved futile. Tōjō was therefore directly respon­sible for the December 7, 1941, attack on Pearl Harbor, which led to the war between Japan and the United States. Emperor Hirohito (posthumously referred to as Emperor Shōwa) had earlier consented to the enterprise on November 2. Upon succeeding to the office of prime minister, Tōjō moved to dominate the government and the war effort by holding a number of key positions: Home Minister from 1941 to 1942, Foreign Minister in September 1942, Education Minister in 1943, Minister of Com­merce and Industry in 1943, and Chief of the Imperial Japanese Army General Staff in February 1944. As Japan’s fortunes in the war against the Allies began sagging after the American victory at Midway (June 4–7, 1942), Tōjō faced increasing opposition from within the government and military. On July 18, 1944, in the wake of another American victory at Saipan (June 15–July 9, 1944), Tōjō resigned from his positions. After the war Gen. Douglas MacArthur issued orders for Tōjō’s arrest. (Tōjō’s predecessor Fumimaro Konoe committed suicide rather than report for arrest.) Tōjō was tried by the International Military Tribunal for the Far East, the Japanese counterpart to the Nuremberg Trials of German leaders. He was found guilty on seven counts, including “war crimes, crimes against humanity, and crimes against peace,” and hanged on December 23, 1948. Neither Tōjō’s emperor nor the immediate imperial family ever faced criminal prosecutions for their part in crimes against humanity and crimes against peace.